Former Karnataka Chief Minister Ramakrishna Hegde’s son Bharat Hegde, daughter Samata and son-in-law Gopal today joined the BJP saying they would like to work under the leadership of Prime Minister Atal Bihari Vajpayee. Describing the multi-crore rupees fake stamp paper scam as the “moral mascot” of the Congress in Maharashtra and Karnataka, senior Bharatiya Janata Party leader Arun Jaitley today said his party would highlight the failures of the “corrupt” S.M. Krishna-led government in Karnataka. Bollywood actress Mousumi Chatterjee and a former “beauty queen” Nafisa Ali, who joined the Congress last week, have been vying with each other to be fielded from the prestigious Lok Sabha seat in south Kolkata. 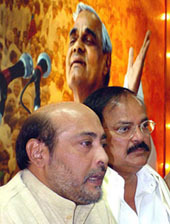 And both have expressed their willingness to contest the election on the Congress ticket against Ms Mamata Banerjee. NDA convener George Fernandes today expressed himself against the inclusion of Ayodhya issue in the manifesto of the BJP-led alliance for the Lok Sabha elections. Ridiculing those smelling communal stink in Hindutva, the Deputy Prime Minister, Mr L.K. Advani, today made it clear that the BJP had not jettisoned its Hindutva agenda and hoped that the Ayodhya issue would be solved amicably after the Lok Sabha elections. A prominent Muslim organisation has urged the government to revive the National Integration Committee (NIC) to resolve the long-pending Ayodhya issue. The term of the Liberhan Commission has been extended for another six months, an official notification said today. The battle between the Indian Institutes of Management and the HRD Ministry appeared to escalate today with the ministry said to be contemplating a look into the entire gamut of functioning of all the six IIMs in the country. Prime Minister Atal Bihari Vajpayee will inaugurate the third India Today conclave here tomorrow. There will be a live address from Pakistan President Pervez Musharraf and US Secretary of State Colin Powell via satellite at the conclave. The Communist Party of India (CPI) has announced names of eight candidates for Lok Sabha seats in Goa, Rajasthan and Uttar Pradesh. The second list released by the CPI Central Office here includes names of a woman doctor from Chittorgarh and two lawyers from Banda and Gonda respectively. The withdrawal of the government investment from the power sector in the country has made the energy situation in the country precarious, the Communist Party of India (Marxist) said here today. A large number of aspirants from Punjab and Himachal Pradesh have descended on the Congress headquarters here to lobby for Rajya Sabha berths. Given the strength of the party in Punjab, it can get three members elected to the Upper House from the state while it can get one member from Himachal Pradesh. The Congress today dismissed reports about fielding joint Opposition candidates against Prime Minister Atal Bihari Vajpayee, Deputy Prime Minister L.K. Advani and Human Resource Development Minister Murli Manohar Joshi. The state Congress began its campaign for the coming Lok Sabha elections by launching its ‘expose BJP yatra’ from Roorkee yesterday. The yatra , which started from Roorkee, reached here in the evening. From there the yatra will pass through other districts of the state. Although the Congress dismissed Deputy Prime Minister L.K. Advani’s “Bharat Uday Yatra” as yet another poll campaign, it has decided not to allow it to go unchallenged. Former Captain of Indian cricket team Bishen Singh Bedi today announced he would campaign for the Congress in the coming Lok Sabha poll. The “Jagriti Jyoti Yatra” was today flagged off by AICC general secretary Oscar Fernandes from the Indian Youth Congress premises here. The Jammu and Kashmir Government has sent a panel of names to the Election Commission for posting as Deputy Commissioners in six districts, following the poll panel’s directive to transfer the incumbents. India today welcomed the start of the process to hand over sovereignty to Iraqi people and hoped that the scheduled date of transfer of sovereignty to them would be adhered to. Dance extras: faceless people of the film industry. This move of the BJP was being seen as an attempt to inherit Hegde’s legacy ahead of the crucial Lok Sabha and Assembly polls in Karnataka, which were being held simultaneously. The Hegdes, who joined the BJP in the presence of its President M Venkaiah Naidu and General Secretary Mukhtar Abbas Naqvi, earlier met Prime Minister Atal Bihari Vajpayee. Mr Naidu claimed that the political scene in Karnataka would undergo a massive change with the entry of Mr K Bangarappa, who joined the BJP earlier, and now Hegdes into the party. The Hegdes had joined the party inspired by Mr Vajpayee’s leadership and convinced by the good work of the NDA government, Mr Naidu said. “There is no tension (caused by the yatra), only attention,” Mr Naidu said in his characteristic style. He said the entry of 15 “leading lights of Kerala” including Padma Shree awardee and actor Bharat Gopi, a former Leftist, into the party reflected the “change in mindset” and the emerging wave in favour of the party in the state. Mr Bharat Hegde said he wanted to pursue his late father’s ideology under Mr Vajpayee’s leadership. Meanwhile, the BJP dismissed as a “stale and pale document without substance” the Congress ‘chargesheet’ against the Vajpayee government and said it would prove to be “counter productive” for the main opposition party. “The Congress chargesheet is a stale and pale document, a hallucination without substance, a chargesheet without any new charge. The party’s spin doctors are trying to revive it and bring it out of intensive care unit with expired medicines,” Mr Naidu said. “The Congress had been repeating the same charges over the past five years and stalled Parliamentary proceedings over them. If they repeat the charges, they will have to repeat their repentance as well. The chargesheet will prove counter productive,” he said. After being denied ticket by the Lok Dal, its state president Jang Bahadur Patel today resigned from the party and joined the BJP. Senior BJP leaders, including Vinay Katiyar and Kalyan Singh were present in the occasion. “BJP is a democratic party while the others, including the Lok Dal and Samajwadi Party, are run by dictators,” Mr Patel said while addressing a press conference here today. Mr Patel, two times MP from Phulpur, was earlier state president of the BSP. But he joined Samajwadi Party after he had some differences with Mayawati and defeated BSP supremo Kanshi Ram in 1996 Lok Sabha election. In 2002 he left the Samajwadi Party and joined the Lok Dal and was made the state president of the party. After Lok Dal and Samajwadi Party decided to forge an alliance for the Lok Sabha election, Samajwadi Party chief Mulayam Singh Yadav gave 10 seats to the Lok Dal. Insiders say Patel wanted to contest from Phulpur but as he was denied ticket he left Lok Dal and joined the BJP. BJP state president Vinay Katiyar denied that Mr Patel had set any pre-condition for joining the BJP. “He has not asked for any ticket nor have we promised any to Patel. The central leadership will decide as whom to give ticket,” he told reporters here. Mr Katiyar charged Samajwadi Party with spreading communal tension. “Just before election the Mulayam Singh Yadav-led government wants communal carnage in the state,” the BJP chief said. Talking to reporters after addressing a joint meeting of the state office-bearers and election committee, he said the BJP would adopt a two-pronged strategy in Karnataka, which is having simultaneous Lok Sabha and Assembly elections in two phases. Mr Jaitley, who is in charge of Karnataka, said the BJP would project the achievements of Prime Minister Atal Bihari Vajpayee-led National Democratic Alliance government and highlight the failures of the Congress in the state. Nothing that corruption cases involving “some close ministerial associates of Mr Krishna were surfacing,” Mr Jaitley said this led to the presumption that the Chief Minister was a mute spectator to the goings on around him. “This Chief Minister adopted a do-nothing approach to problems in the last four and half years,” he alleged. He claimed that while the BJP’s social base was expanding, that of the Congress was “shrinking substantially,” he noted. There was going to be a change in voting pattern at the grassroots level during the election which would benefit the BJP ultimately, he opined. Mousumi says she was born and brought up in south Kolkata and, therefore had a natural claim on the south Kolkata seat. She is confident that she can take on Ms Banerjee, who, Mousumi alleged, had betrayed the people of Bengal by rejoining the BJP and the RSS to protect her own interests. Nafisa was not born in Kolkata but she spent her early days in the city. She studied Bangla and can also speak in it. But Nafisa and Mousumi don’t live here. Mousumi often travels down to Kolkata from Mumbai for professional as well as family reasons. (She is married to renowned singer Hemanta Mukherjee’s son, Ritesh). Nasifa, on the other hand, lives and works in the national Capital and seldom flies down to the city. She is not only an athlete but a social worker, too, and spends most of her time on various social welfare activities in the Capital and elsewhere. Tomorrow, Nafisa in coming down to Kolkata to meet the state Congress leaders and workers to assess how far she would be acceptable to the people against Ms Banerjee. She says she has no personal enmity against Mamata. But she thinks that Mamata has sacrificed her ideology for a ministerial post. Nafisa says no one else can be a better match for Ms Banerjee than her. She made it clear to Ms Sonia Gandhi and the WBPCC president, Mr Pranab Mukherjee, whom she met recently, that she could only contest in the election if she was allowed to file her nomination in south Kolkata against Ms Banerjee. Mousumi, however, says she has no special fascination for the south Kolkata seat and that she will be ready to file her nomination from any other seat offered to her. But she is confident that she only can defeat the firebrand Ms Banerjee and she feels the Congress will commit a mistake in denying the ticket to her against Ms Banerjee. The Congress, however, has not finally decided who will be the party’s candidate in south Kolkata, where the CPM has already decided to field Mr Rabin Dev, the south Kolkata party MLA, against Ms Banerjee. A section of the Congress leaders and workers favour that Mousumi be given the ticket to fight against Ms Banerjee. But several others prefer Nafisa as a “better” candidate. The Congress list will be finalised on March 14, when the party’s candidate for south Kolkata may be formally known. “There are parties (within the NDA) which have their reservations. They have their own understanding of how the issue (Ayodhya) is to be resolved. So why bring it up in the agenda for governance? We are concerned with governance,” he told NDTV. Mr Fernandes said to make the BJP’s allies “more involved” in the functioning of the NDA, the alliance will be given a “proper political structure” after the parliamentary elections were over. This would ensure that the points of view and grievances of the allies were properly addressed, he said. The NDA convener admitted that one of the reasons why there had been an agreement on creating a “structured NDA” had been the fact that many NDA members had left the alliance in recent months. Speaking to reporters on the second day of his month-long countrywide ‘Bharat Uday Yatra’, Mr Advani said even the NDA constituents had discussed the Ayodhya issue several times. ‘’I am optimistic that the efforts of the past six months would succeed and both the communities would reach an agreement soon after the elections,’’ he added. Mr Advani was replying to a volley of questions on the Ram Temple issue and the party’s Hindutva agenda. Asserting that Hindutva was a way of life, Mr Advani said it was very much part of the BJP programme, though the word as such was not being used in the campaign. The party interpreted it as Indianness. Countering arguments that the BJP had dropped the Sangh Parivar agenda, he said the Jan Sangh’s priority was also nationalism. “We suggest that the NIC, which became defunct in 1992, be revived and one Hindu, one Muslim and one person from some other community be nominated to it,” said Habeeb, a former spokesperson of the All India Muslim Personal Law Board. Habeeb, who is also the president of the Bharti Majlis, said the organisation could support some NDA leaders, particularly Prime Minister Atal Bihari Vajpayee if the contentious issues like Uniform Civil Code and Article 370 were kept out of the BJP’s ‘vision document’. The commission’s term is scheduled to expire on March 31. The commission, headed by Justice M.S. Liberhan, was set up by the Centre 10 days after the ‘’demolition” of the Ram Janmabhoomi-Babri Masjid structure at Ayodhya on December 6, 1992. The battle between the Indian Institutes of Management (IIMs) and the HRD Ministry appeared to escalate today with the ministry said to be contemplating a look into the entire gamut of functioning of all the six IIMs in the country. “We will tell them to make proper bylaws of the IIMs for their proper functioning”, official sources said in the backdrop of a tussle between the ministry and the IIM-Ahmedabad over reduction of fee for the admission to the prestigious B-schools. It is understood that the ministry is thinking on those lines after it noticed that the society which manages the running of IIM-A did not maintain proper records for the fee hike all these years and enrolment of members to the society. Barring Kozhikode and Indore, the two relatively new IIMs, the sources said that four IIMs at Kolkata, Bangalore and Lucknow, besides Ahmedabad had no bylaws all these years. Asserting that the Memorandum of Association (MoA) gave the Central Government powers to take over the administration of the institution, the sources said that the efforts of the government were aimed at streamlining the system so that everyone followed the rules. The sources said records available showed that the IIM-A society had never made any bylaws amending the fee structure, implying that the increase of fees over years was “illegal”. They said the reduction of fees was on the agenda of a meeting held way back in June 19, 2000 and the issue was debated for four years. The theme of the two-day conclave — “India Tomorrow 2004: Building an Indian Century” — is based on the belief that India is advantageously positioned to become a world leader, India Today group’s Editor-in-Chief Aroon Purie said. Mr Vajpayee will deliver his keynote speech tomorrow on “How to build an Indian century”. This will be followed by the External Affairs Minister’s address on “Geo-politics: what It takes to be a world power”. Others to address the conclave include Leader of the Opposition and Congress President Sonia Gandhi, Disinvestment Minister Arun Shourie, Air Chief Marshal S. Krishnaswamy, Bollywood star Shahrukh Khan, Yale Professor and internationally renowned historian Paul Kennedy, Reliance Industries Chairman and Managing Director Mukesh Ambani, IMF Economic Counsellor and Research Director Raghuram Rajan, Harvard Business School Professor Tarun Khanna and ITC Chairman Yogesh Deveshwar. Mr Powell will address the conclave via satellite tomorrow. The Communist Party of India (CPI) has announced names of eight candidates for Lok Sabha seats in Goa, Rajasthan and Uttar Pradesh. The second list released by the CPI Central Office here includes names of a woman doctor from Chittorgarh and two lawyers from Banda and Gonda respectively. The party announced its second list following deliberations during a three-hour meeting of the Central Secretariat. The party decided to contest Panaji and Marmagao Parliamentary seats in Goa where it was confident of the support of the working and middle classes. It fielded trade union leaders Christopher Fonseca and R.D. Mangueshkar for the Panaji and Marmagao seats, respectively. In Rajasthan, the party announced the name of Dr Radha Bhandari for the Chittorgarh seat and Mr Megh Raj Tawad, former MLA for the Salumber tribal seat. In Uttar Pradesh, the party was fielding a young advocate and party office-bearer Chandra Pal from Banda, Mr Suresh Tripathi, another lawyer, a peasant leader and chairman of CPI’s State discipline committee from Gonda, Mr Sitaram Patel, a member of the National Council from Machlishahar and Mohammad Saleem, a trade union leader from Shahjahanpur. The CPI had on February 26 announced names of 16 candidates for Lok Sabha seats in nine States. The CPI National Secretary, Mr D. Raja, told TNS here today that the third and final list of the party would be announced by mid March. The party was yet to announce names of candidates and seats in Andhra Pradesh, Bihar, Orissa and Uttaranchal. It would finalise list of candidates for Andhra Pradesh and Orissa after a dialogue with the Congress. It would announce names for Bihar after holding talks with RJD chief Laloo Prasad Yadav on seat adjustment. Countering the “India Shining” campaign, the Left party said darkness gloomed everywhere as little addition had been made to the generation capacity and the private players in the energy sector were hiking the tariffs. The party said power generation in the four and a half years of the NDA rule was 40 per cent less than the Ninth Plan target. The Central and the state governments together added only 13,500 MW of power between 1997-2002 while an additional 5,643 MW was produced by private players as compared to 21,000 MW added in the Seventh Five Year Plan, the party said, citing official statistics. Issuing the third set of figures in its series of ‘Lies, Damned Lies and Statistics’ to counter what it called the government’s “disinformation” campaign, Politburo member Prakash Karat told reporters here that the “greatest fiasco” in the power sector was the “standing white elephant - the Dabhol power project”, the “only” policy decision taken by the Vajpayee government during its 13-day rule in 1996 when a counter-guarantee was given to a US multinational, Enron. Not only Enron, but today state-owned PSUs like the NTPC were producing more power in the country than all the private sector and fast-track projects put together, CPM MP Nilotpal Basu said. Meanwhile, the CPM, today described Mr L K Advani’s attack on the role of Communists during the freedom struggle as “ridiculous”. The party said the Deputy Prime Minister should instead tell as to which RSS leader played “any worthwhile role” during that period. “Like Mr Advani himself, there is no single leader of the RSS and its outfits who can claim to have played any worthwhile role in the freedom struggle,” Mr Karat told reporters here. It was well-known that the Communist Party in Tamil Nadu was formed by leaders who belonged to the Congress-led	national movement, Mr Karat said, adding “only Mr Advani can say such a thing as he himself has not played any role in the freedom struggle”. The CPM leader said Nagercoil in Tamil Nadu, where Mr Advani campaigned yesterday for a BJP candidate, was traditionally a Communist base and “the people there, just as people elsewhere, will see through this fake demagogy indulged in by the BJP leader”. A large number of aspirants from Punjab and Himachal Pradesh have descended on the Congress headquarters here to lobby for Rajya Sabha berths. 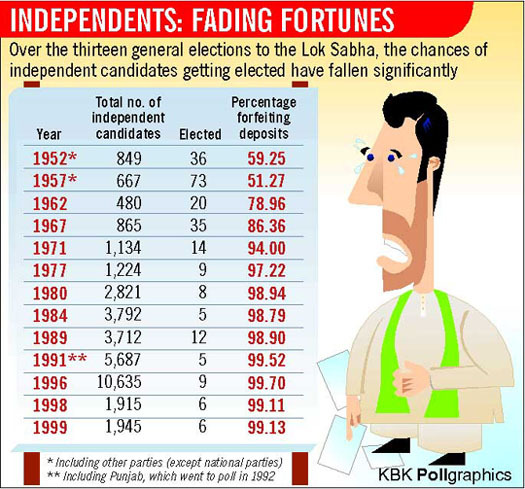 Given the strength of the party in Punjab, it can get three members elected to the Upper House from the state while it can get one member from Himachal Pradesh. Although Congress president Sonia Gandhi has the final say in this matter, the choice is normally made from a panel of names forwarded by the state party unit. Party sources said a list of 15-20 names has been sent by Punjab Chief Minister Amarinder Singh for the three seats which, it was stated, would be given to a Sikh, a Hindu and a Scheduled Caste candidate. Those in the race, include former minister Sukhbans Kaur Bhinder, sitting MP from Faridkot Jagmeet Brar, state unit president H.S. Hanspal, retiring member Ashwani Kumar and OSD to Punjab CM Lakhwinder Garcha. According to party insiders AICC general secretary in charge of Punjab and Rajasthan Mohsina Kidwai is also tipped to be a strong contender. Others in the fray, include Bathinda MLA S.S. Singla, PPCC vice-president M. M. Singh Cheema, ex-MP Kewal Singh, former ministers Dharampal Singh and Ishar Singh. Punjab Congress has also listed Ms Bhinder and Mr Ashwani Kumar as their choices for the Gurdaspur Lok Sabha seat. However, neither of the two is keen on contesting. They have instead made a bid for the Rajya Sabha. Mr Brar has also declined an offer to contest from Faridkot though the state unit has recommended his name for that seat. Mr Brar, who faces a tough contest in his constituency, has said he would prefer a Rajya Sabha berth. If not chosen for RS he has shown indication to contest from the Ferozepore Lok Sabha seat. If there is a scramble for the three Punjab seats, there is a similar rush for the lone Himachal Pradesh seat. Chief minister Virbhadra Singh’s supporters are in the Capital lobbying hard for his wife Pratibha Singh. They are arguing that since the Punjab Chief Minister’s wife has been given a Lok Sabha ticket, Mr Virbhadra Singh’s wife should be “rewarded” with a Rajya Sabha seat. Party spokesperson Anand Sharma also figures in the list of aspirants which, includes Ms Devi Cherian, wife of Dilip Cherian, whose PR firm is handling the Congress party’s media campaign. In addition to these, several former legislators and state ministers like Natha Singh, Bikram Katoch and K.D. Sultanpuri have also staked their claim to the Rajya Sabha seat. “You are assuming that there is going to be an all-India alliance of Opposition parties....which is not the case. For instance, we do not have a pre-poll alliance with the Left parties and several others,” senior AICC leader Pranab Mukherjee said here in response to questions. He maintained this would only be possible in a bipolar election while this is a multi-polar election. Former Law Minister Ram Jethmalani has offered to take on Prime Minister Atal Bihari Vajpayee in Lucknow, provided he was supported by the entire Opposition. Although the suggestion of joint Opposition candidates was mooted by the CPM, it had met with a lukewarm response from the other Opposition parties with the Samajwadi Party even naming its candidate for the Lucknow seat. The yatra was flagged off by state Minister for Parliamentary Affairs, Mrs Indira Hridesh, state Minister for Irrigation, Shoor Veer Singh Sajwan, state Minister for Transport, Heera Singh Bisht and Chairman of the state OBC Commission Kunwar Pranav Singh Champion. Addressing the gathering, the ministers and party functionaries exhorted the party workers to expose the farce of the feel good factor being flaunted by the BJP. 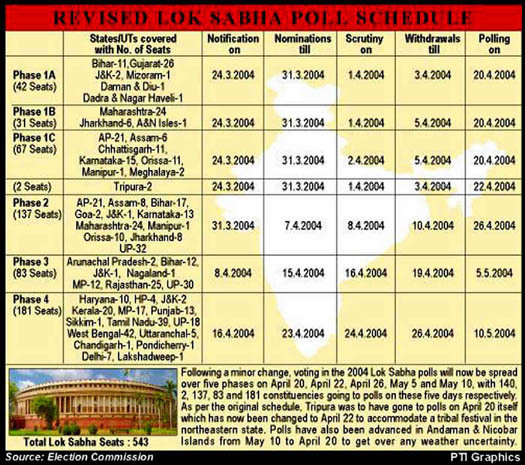 The leaders state unit of the party, which has only one seat in the dissolved Lok Sabha, are trying hard to improve its tally. The state has five Lok Sabha constituencies. The strategy of the party, which is the ruling party in the state, is to minimise the affect of the anti-incumbency factor by exposing the BJP-led NDA government on the issues of rising unemployment and corruption. As a strategic move, party’s leaders will fan out to different cities and towns along Mr Advani’s route where they will dispute the Deputy PM’s claims, highlight the NDA government’s failures and raise questions about the poll promises made by the Vajpayee government. For instance, Lok Sabha MP Renuka Chaudhary was in Thiruvanthapuram to seek answers from Mr Advani when he set off on his yatra from Kanyakumari on Wednesday. “There will be a series of such coincidences,” stated a senior party leader. The idea is to minimise the impact of Mr Advani’s pre-election rhetoric. Armed with the chargesheet against the NDA government, these Congress leaders will point to the financial scams which surfaced during the NDA regime. “What is the need for joining the party. I am a born Congressman”, the noted left arm leg spinner commented on reports that he had joined the Congress. The “yatra” will take the “Jagriti Jyoti” handed over by Congress President Sonia Gandhi to the IYC chief Randeep Singh Surjewala and NSUI President Ashok Tanwar, across 74 districts in 10 states. According to an IYC spokesman, the yatra will be completed in three phases. The first phase will reach Srinagar on March 16. 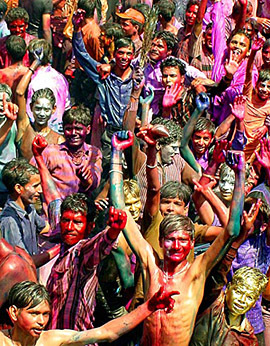 The second phase will start from Amritsar on March 19 and end at Godhra on March 27. The third and final phase will start from Jhabua, the birth place of late Chandra Shekhar Azad, and end at Lucknow on April 8. EC sources said a decision on the new posting would be taken after the return of the full Election Commission which is at present in Andhra Pradesh reviewing the preparation for General and Assembly polls in the state. The commission had ordered transfer of DC of Doda, Rajauri, Kathua, Srinagar, Kupwara and Anantnag and the SSP of Jammu. “The Government of India welcomes the start of the process to hand over sovereignty to Iraqi people and hopes that the scheduled date of transfer of sovereignty to the Iraqi people will be adhered to,” the Ministry of External Affairs said in a statement. The MEA statement comes after members of Iraq’s Governing Council had signed the landmark interim Constitution earlier this week after resolving a political impasse sparked by objections from the country’s most powerful cleric. The signing was a key step in US plans to hand over power to the Iraqis by July 1. The Iraqi Governing Council signed a landmark interim constitution in Baghdad on March 8. The statement said New Delhi had taken note of the unanimous agreement providing for a temporary legal framework to govern Iraq during the transitional period commencing on June 30, 2004 till a definitive Constitution was in place by December, 2005. 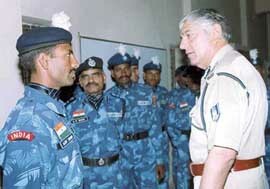 J.K. Sinha, Director General, CRPF, interacts with the second contingent of fifth batch of RAF personnel leaving on UN peacekeeping mission to Kosovo on Thursday.